PracticeLink.com S UMMER 2018 27 F I N A N C I A L F I T N E S S a federal student loan issued prior to October 1, 2007, and who took out a federal student loan on or after October 1, 2011, are eligible. Revised Pay As You Earn (REPAYE) R e PAY e became available in December of 2015, and it may make sense for continuing house staff to consider entering the program. Here's a brief summary of its features: • 50 percent of accruing interest is paid by the government (making unsubsidized loans partially subsidized) • Payments of 10 percent of discretionary income required (just like PAY e ) • PS l F eligible • If you switch into R e PAY e from IBR, the 10-year forgiveness clock won't reset (unless you consolidate) • Household income will be used regardless of how you file taxes • 25-year taxable forgiveness for graduate students • No cap to payments (10-year standard in IBR & PAY e ) A note about enrolling Once you enter one of these IDR plans, you cannot be removed from them (although you ca n sw itch between them as appropriate), even if the hardship that qualified you does not exist after training, when you're making more income. 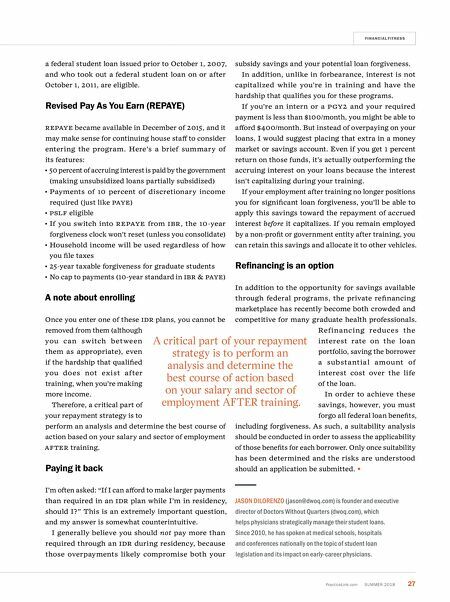 Therefore, a critical part of your repayment strategy is to perform an analysis and determine the best course of action based on your salary and sector of employment AF te R training. Paying it back I'm often asked: "If I can afford to make larger payments than required in an IDR plan while I'm in residency, should I?" This is an extremely important question, and my answer is somewhat counterintuitive. I generally believe you should not pay more than required through an IDR during residency, because those overpayments likely compromise both your subsidy savings and your potential loan forgiveness. In addition, unlike in forbearance, interest is not capitalized while you're in training and have the hardship that qualifies you for these programs. If you're an intern or a PGY2 and your required payment is less than $100/month, you might be able to afford $400/month. But instead of overpaying on your loans, I would suggest placing that extra in a money market or savings account. Even if you get 1 percent return on those funds, it's actually outperforming the accruing interest on your loans because the interest isn't capitalizing during your training. If your employment after training no longer positions you for significant loan forgiveness, you'll be able to apply this savings toward the repayment of accrued interest before it capitalizes. If you remain employed by a non-profit or government entity after training, you can retain this savings and allocate it to other vehicles. Refinancing is an option In addition to the opportunity for savings available through federal programs, the private refinancing marketplace has recently become both crowded and competitive for many graduate health professionals. Ref i na nci ng reduces the interest rate on the loan portfolio, saving the borrower a substa ntia l a mou nt of interest cost over the life of the loan. In order to achieve these savings, however, you must forgo all federal loan benefits, including forgiveness. As such, a suitability analysis should be conducted in order to assess the applicability of those benefits for each borrower. Only once suitability has been determined and the risks are understood should an application be submitted. JASON DILORENZO ( jason@dwoq.com) is founder and executive director of Doctors Without Quarters (dwoq.com), which helps physicians strategically manage their student loans. Since 2010, he has spoken at medical schools, hospitals and conferences nationally on the topic of student loan legislation and its impact on early-career physicians. 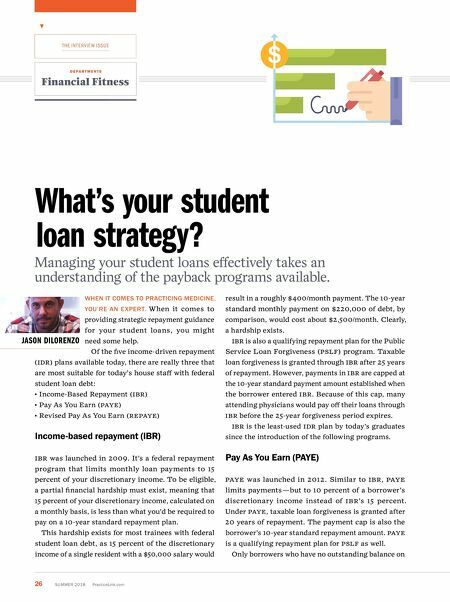 A critical part of your repayment strategy is to perform an analysis and determine the best course of action based on your salary and sector of employment AFTER training.